In an essay posted on the RT portal yesterday, Vladislav Surkov argues that the West is suffering from “a crisis of hypocrisy” in which people are no longer prepared to accept the shibboleths of the past and are demanding a clearing away of the existing political and social system (russian.rt.com/world/article/446944-surkov-krizis-licemeriya). The aide to Vladimir Putin argues that a society is “stable if all its elements find a common language with each other, a language in which it is comfortable to lie.” That makes it possible, he says, “to say one thing, to think another and to do a third,” a pattern that is “inevitable” in the “rationalist West” for two reasons. “In general, hypocrisy is offensive, effective and inevitable. But hypocritical discourses, languages in which they life, and metaphors of hypocrisy periodically get old. From frequent repetition,” the phrases people are accustomed to attract attention for what they hide and fail to take into consideration. When that happens, Surkov says, people cry out, “They’ve deceived us!” and demand change. That leads to a period of turbulence “which lasted until in arguments and confrontations” people come to accept a new “‘improved’ hypocrisy” and agree at least for a time to live according to its postulates. That is the phrase, he suggests, one in which falsehoods have become “unbearable” and imposed norms have led only to “disappointment,” which “now several Western nations are passing through.” And that fact helps to explain many of the strange combinations now on view there. There are some historical cases where a civilization has gone through such a transition. The classical one is when the democratic-oligarchic structure of the ancient Roman Empire “at a certain movement became too complicated and began to be viewed as chaos instead of order.” As a result, emperors arose who kept the old forms but deprived them of their earlier meaning. Today, on the Rosbalt portal, Vladislav Inozemtsev, an economist at Moscow’s Higher School of Economics, responds by noting that despite all the insights Surkov has displayed, his article suffers from two major shortcomings that must be corrected before it leads Moscow in the wrong direction (rosbalt.ru/posts/2017/11/07/1658974.html). 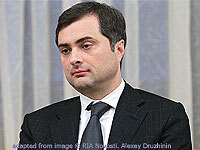 On the one hand, and despite his qualification that such an outcome is only one of the possibilities, Surkov is clearly enamored of the idea that the way out of what he calls “the crisis of hypocrisy” is through a dictatorship of one kind or another rather than through the expansion of political participation. And on the other – and this is Inozemtsev’s more serious objection – Surkov acts as if this crisis affects only the West. In reality, the Moscow economist says, Russia is in no way an exception – and in fact can’t be, as Surkov has implicitly acknowledged elsewhere by arguing that Russia is part of European civilization. What the Russian leadership should be doing, Inozemtsev continues, is proposing to work together to understand and then recover from “the spreading epidemic of post-truth, political correctness and inconsistencies” rather than doing exactly the opposite and promoting those things in the belief that they won’t harm Russia too. Unfortunately, and this is the real tragedy, the Moscow economist concludes, Surkov instead of being informed by his own logic on this issue has devoted enormous effort to doing what should not be done and what will ultimately harm Russia even as it continues to harm the West.